On offense, the most important position is the quarterback but arguably the second most important is the center because he is the one who snaps the football and gives the ball to the quarterback in the first place. The center must also be the quarterback of the offensive line and communicate the blocking assignments to the rest of the offensive line. There aren't many defensive linemen that are big at 300 lbs and are quick but Winnfield DT LaTerrion Green is one of those players. If you look at Josh Tourelle, you would think that Tourelle plays in the NFL not in high school. He is 6'3 around 230 lbs. That is the normal height and weight for a linebacker in the NFL level. Sulphur QB Byron Walker may not be the biggest guy on the field but boy is he fast. Byron Walker is probably the fastest QB in the state and that even includes Lowell Narcisse (St. James). That would be a great race to watch between those guys but Walker is not just a running quarterback. He is a quarterback that can run. Brother Martin RB/OLB Bruce Jordan-Swilling is arguably the best high school football player in the state of Louisiana and one of the best recruits in the entire country. For all the New Orleans Saints football fans, Bruce is the son of future hall of fame linebacker Pat Swilling, who played seven seasons with the New Orleans Saints and had five Pro Bowls in his career. Bruce Jordan-Swilling is looking to build his own legacy and has impressed a lot of high school football fans since he first started for the Crusaders as a sophomore. There are a lot of great quarterbacks in the state (Lowell Narcisse, Aldon Clark, Miles Lapeyre, etc. ), but maybe not as physically ready as Robert Scott Foust who is 6'3 and over 200 pounds. He is everything that you want in a quarterback. There is a quarterback tradition at Isidore Newman High School. Think of some of the best quarterbacks in the NFL. You think of Peyton Manning and Eli Manning. Both those quarterbacks went to Isidore Newman High School. This year, there is another quarterback that can add his name to QBU and that is Miles Lapeyre. Neville High School has been one of the best high school football programs in the last decade. 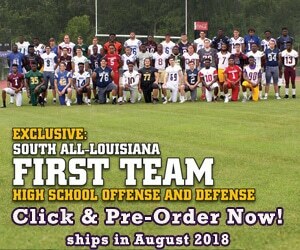 Over the years, they have the fourth most state championships for Louisiana High Schools trailing only John Curtis, Haynesville, and Evangel Christian. The school has also produced some great players such as John Diarse (former LSU Wide receiver), Rashard Lawrence (LSU committ), and Kavontae Turpin (TCU). Just to name a few, but maybe the next great player to come out of this school is the guy we are going to interview today.